We have just completed the audit of our Smart Contract and as a result have made the decision to drop the ERC-223 standard in favor of ERC-20 so Opu Coin holders will enjoy more robust security. Also, based on feedback from the community, we decided to adopt real-time minting which eliminates the need for a growth reserve. This will make the post-ICO token economy even more attractive while providing for stable long-term growth. Furthermore, Opu Labs will be implementing a smart contract to fulfill network transactions from public token holders before minting new tokens. We have defined this Buy-Back System in our latest white paper update which is now available on our website. Users who earn Opu Coin through token-creation events will receive these tokens through real-time minting rather than from a pre-minted supply in a growth reserve. This simply means that new OPU reward tokens will be created with each token-creation event rather than issuing them from a reserve created at launch. By switching to a real-time minting system, Opu Labs will be able to effectively scale with the market for five or more years of growth. The Buy-Back System will be created to establish a method for public token holders to sell their tokens and to fulfill user transactions on the OPU network. This system provides liquidity to public holders and also ensures that Opu users are protected from external market volatility. The smart contract will use an average market price for OPU purchase orders that are created within the application. In the case where a new transaction cannot be fulfilled from a public token holder (due to price or supply), new Opu Coins will be minted in real-time. With the elimination of the Growth Reserve, we have taken this opportunity to adjust the overall allocations. 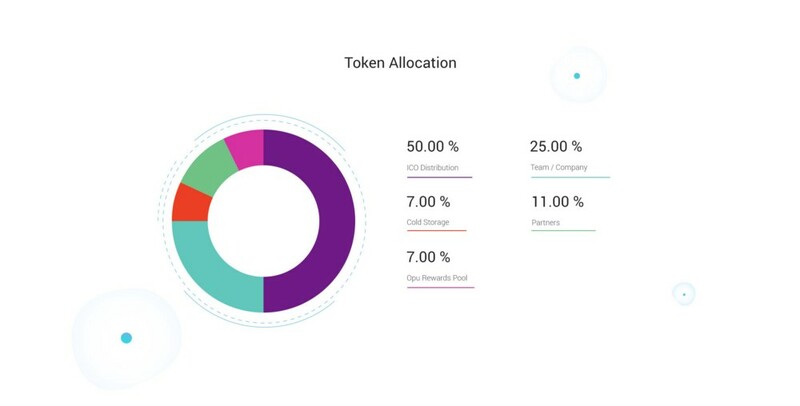 We have added tokens to the OPU public sale pool to take it up to 50% and reduced the cold storage, founder/team and partner pools. This reallocation is in line with the excellent feedback we have received from the community. As a result of the increase in the size of the ICO token pool, we will revalue the token sales price from the previous rate of $0.059259 per OPU to $0.037000 per OPU. This pricing will be fully retroactive and all previous purchasers will be compensated with bonus tokens to match the new rate. This is not a discount but rather the result of the increase in the size of the ICO token pool. The net positive effect of these changes will be to drive the projected tokens per wallet from just over 13,000 after launch to approximately 408 by year 5. This is a 33X increase in token scarcity across the ecosystem and should be expected to drive OPU coin towards significant value creation. Furthermore, for the first two years of trading the public holder allocation will represent the vast majority of the circulating tokens due to the combination of holding periods for team/founders and the addition of the Buy Back System. Growth Reserve eliminated and replaced with real-time minting. Buy-back System defined and committed in our white paper. Increase in ICO Pool and token sale repricing. Our token re-distribution is geared towards aligning with more traditional ICO structures while simultaneously incorporating innovative features to allow for long-term growth within our ecosystem. Combined with our new Buy-Back System, Opu Labs has created numerous new ways to drive utility of the Opu application and manage speculation on secondary exchanges. For more information on these new feature, please visit our website and download the updated whitepaper.